Erica is a junior at James Madison University, an employee of Madison Union, and the University Unions Employee of the Month for March. She holds a position as the Assistant Student Scheduler for MU, working hard to help make sure that spaces can be reserved for events, shows, and other activities for many organizations around JMU. Erica always goes above and beyond in her position with her incredible customer service skills. 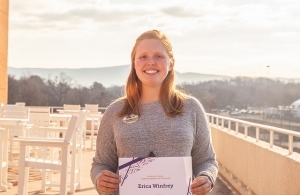 Erica’s ability to work well with people and meet their needs helps ensure that many JMU organizations are happy and able to do their best work. She is great at seeing the big picture, which makes her a strong asset when it comes to something like scheduling, where there are many potential conflicts and overlapping needs. Erica is helpful and clear, which allows her to make sure that MU can avoid any potential misunderstandings. Having come to scheduling from working at Event Services, she had a good background in events and their varied needs, making her very well rounded. “Her communication with our customers is impeccable,” said Ada Hale, the Assistant Event Scheduling Coordinator. Erica’s skills translate not only to the way she does her job, but to how she treats everybody around her. She is a bright and joyful presence within the office and cares about those around her. She is great at her job because she comes from a genuine place, loving to help others.